A deepening, empowering collective discovery. This course is aimed at people with existing knowledge of permaculture. It will be useful and relevant to anyone working in group situations; from workshop leaders to transition groups, from the workplace to community groups to families. 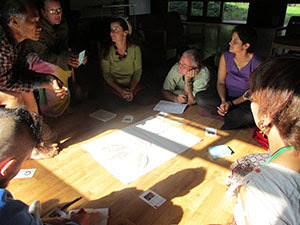 It will be valuable for existing permaculture teachers who want to develop or specialise in social permaculture. Social permaculture has arisen out of the need to focus on us as people, how we can inter – relate, motivate, inspire, act co-operatively and effectively to bring about positive benefits for the planet and people to secure our future. Social permaculture recognises the value and effectiveness of applying permaculture principles and design to all relationships. This is a one-off opportunity to learn from this constellation of facilitators. Social permaculture is being pioneered by these 5 facilitators and is currently considered to be one of the cutting edges of permaculture. This course aims to bring it more to the forefront and integrate it into the wider permaculture movement. Together there will be rich emergence, we will be creating more answers and pushing the edges of social permaculture. What will the course give? Starhawk is the author of The Empowerment Manual: A Guide for Collaborative Groups and 11 other books. She brings forty or more years of experience with horizontal, co-creative organizing, facilitating, and teaching, a lifetime of experiences sometimes wonderful, sometimes horrific! Her special interests are in working across the lines of diversity, and in helping groups learn the communication tools and interpersonal skills to navigate conflict. Robin Clayfield is an International Facilitator, Educator, Social Change Agent and Author. She brings over 3 decades of Permaculture Facilitation, her cutting edge 'Dynamic Groups, Dynamic Learning' Methodology plus abundant skills, processes, passion and a deep love of group work and caring for people. As well as learning in the whole group, there will be affinity groups where there is further opportunity to share and try out the tools and processes. Throughout the course we will be learning through doing and reflecting on our experiences. We will be grounding the learning in people's real experience and offering opportunities for people to follow-up their learning with intentions and tool-boxes to go home with. We will be learning from the wisdom of the group as well as from the facilitators. Through the cross fertilisation of best practices we will be co-creating to enhance the scope of social permaculture. There will be plenty of learning through play, with lots of skills, processes and insights to share. 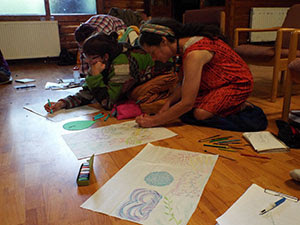 The course itself will be a living, embodied example of social permaculture, where we have the opportunity to co-create a culture that engages, enables and empowers, while embracing diversity and deepens connections. This course will be powerful, revitalising and inspiring. It will be a transformational personal and collective adventure. Price includes all food, tuition. Accomodation is either camping or in shared rooms in the eco-lodge. 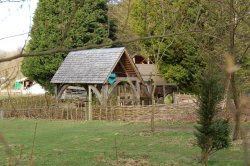 Camping is included in the price and for the lodge there is an additional charge of £5 a night i.e. £25 for the entire course.